The final vote count on the Christopher Hill nomination was 73 for YEAs and 23 for NAYs, with three senators not voting. Senators Brownback, McCain, Graham, Kyl were among those who voted Nays. 17 other GOP senators joined 56 Democrats to confirm Ambassador Hill. Senators Kennedy, Roberts and Rockefeller, did not vote. Just for the record, the debate on Ambassador Hill’s nomination in the Senate yesterday ate 29 pages of the Congressional Record. Imagine how many more pages would have been added if the senators went on for 30 more hours of debate as was originally agreed. The generals and former ambassadors were invoked repeatedly by the senators. Generals Petreus and Odierno and the former ambassadors to Iraq where cited here by Senator Kerry. Senator Whitehouse, a former FS brat (father and grandfather were FS officers) also did the same here. It is clear that the majority were able to round up more support for this nomination than the minority party; there certainly were more Senators who took to the floor in support of this nomination than those who opposed it. But Senator Kerry was the most steadfast supporter and returned every ball served by the senator from Kansas. 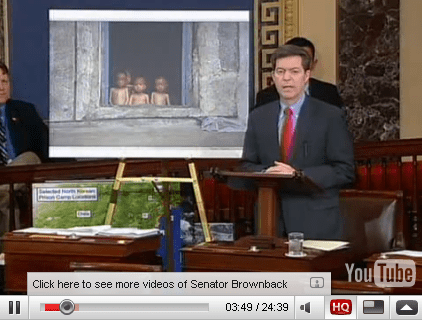 At one point Senator Kerry called out Senator Brownback on one of his props, er exhibits of the starving children of North Korea. The senate rigodon is over, but it ain’t over. There’s a lesson here for career diplomats but that’s for another post. Mr. BROWNBACK. Madam President, today is a sad day in the history of the world…. Mr. CASEY. Madam President, I thank the Chair. Mr. CASEY. I yield the floor, and I suggest the absence of a quorum. Mr. DURBIN. Madam President, I yield the floor. The State Department’s official blog, DipNote got a splash of colors today, just in time for Earth Day. There is also a video post from the Special Envoy for Climate Change, Todd Stern. Check it out here. Secretary Clinton has appointed Ambassador Richard L. Morningstar as Special Envoy for Eurasian Energy (S/EEE). In 1998, Ambassador Morningstar had been Special Advisor to the President and the Secretary of State for Caspian Basin Energy Diplomacy. He was responsible for assuring maximum coordination within the Executive Branch of U.S. policy and programs relating to the development of oil and gas resources in the Caspian Basin. Development of the Caspian and open commercial access to its energy resources are key priorities of the Administration. In April 1995, Ambassador Morningstar was appointed as Special Advisor to the President and Secretary of State on Assistance to the New Independent States of the former Soviet Union, and on June 11, 1996, the Senate confirmed him with the rank of Ambassador. He oversaw all bilateral assistance and the trade and investment activities of the 16 U.S. government agencies engaged in technical assistance, trade and investment, exchange, weapons dismantlement, and other programs in the NIS. After his stint at USEU, he became Senior Director at Stonebridge International LLC, and Senior Counsel at Nixon Peabody since 2004. He was a Visiting Scholar and Diplomat in Residence, Stanford Institute of International Studies (2002), the Herman Phleger Visiting Professor of Law at Stanford Law School, 2002 and has been an Adjunct Lecturer at the Harvard University Kennedy School of Government (2003—Present). Updated: on 4/23/09 with links to opening statement and testimonies.